AI-FOX contains knowledge on the implant and on the psychoacoustic behaviour of CI recipients. A sound coding algorithm such as ACE in a cochlear implant processor contains several hundreds of parameters, all affecting the electrical stimulation patters produced by the implant. Some of these parameters act locally, such as the T-level of a particular frequency will dominantly change the electrical stimulation level for the associated frequency band at soft levels. However, many parameters have a more global effect, for example the TSPL or Q parameter, influencing the stimulation levels across frequency bands and presentation levels. In addition, modern sound coding contain also adaptive processing algorithms. Therefore, it is a difficult task to correctly infer what effect a change in a parameter in terms of the electrical stimulation will produce. AI-FOX contains a model of the behaviour of the Nucleus CI with the transfer functions from the acoustical to the digital domain and from the digital to the electrical domain. This dynamic application also models the impact of changing MAP parameters. AI-FOX uses this model all the time to calculate the effect of MAPs and MAP-changes. AI-FOX contains models of the relationships between electrical parameters and hearing outcomes. The relationships are modelled by means of newly built probabilistic graphical models and other tools of artificial intelligence. Vaerenberg B, et al. A uniform graphical representation of intensity coding in current generation cochlear implant systems. Ear Hear 2014; 35(5):533-43. Bermejo I, et al. 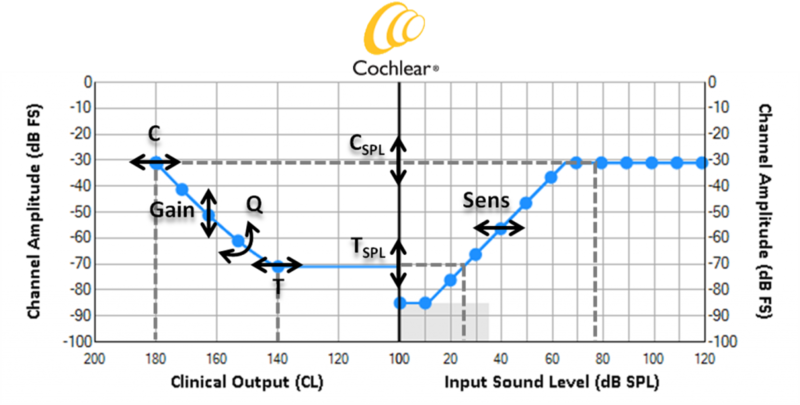 A Probabilistic Graphical Model for Tuning Cochlear Implants. In: Peek N, Marin Morales R, Peleg M (Eds.). Artificial Intelligence in Medicine. Springer-Verlag (Berlin-Heidelberg), 2013; pp 150-155.